Designed for use after the insertion of a new damp proof course to stop salts and control damp passing through the wall in the drying out stage. Our Renovating Plaster is a pre-mixed, dry-bagged, lightweight, cement-based plaster containing perlite. It has been developed to control dampness passing through the plastered walls of old properties. It can also be applied shortly after the insertion of a new damp proof course or used in conjunction with basement tanking systems such as PermaSEAL Tanking Slurry and Remmers Sulfatex Waterproofing Grout. It is designed to have similar properties to a 1:1:6 cement : lime : sand plastering mortar, but with Perlite lightweight aggregate replacing the sand. This lightweight backing plaster is designed to control dampness passing through walls. Waterproofing and salt inhibiting additives are used to achieve this. They also help to minimise efflorescence and control pattern staining. The special constituents including lime in Renovating Plaster ensure an alkalinity which inhibits mould growth. Man-made fibres are also incorporated to control shrinkage and improve flexural strength. This Renovating Plaster can also be used in conjunction with SBR Bonding Additive to further improve the overall resistance to moisture and salts and to further control shrinkage. It should be used in accordance with the recommendations of BS 5492:1990 Code of Practice for Interior Plastering. It can also be used as a replacement for Limelite Renovating Plaster. Our Renovating Plaster improve thermal performance, reducing the risk of condensation on internal walls and in basement areas. 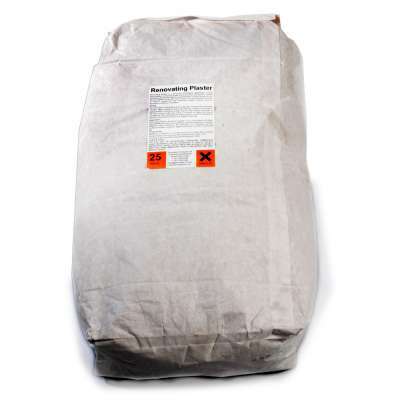 Renovating Plaster is supplied in a 30 litre bucket, ideal for mixing and dry storage. Renovating Plaster can be used for plastering most traditional background materials during renovation work and also following the installation of a new damp proof course or system. Renovating plaster is not recommended for use over plasterboard, similar paper faced building boards or backgrounds having a bituminous coating or traces of gypsum. All surfaces should be thoroughly cleaned to remove dust and other friable material. Masonry joints need to be raked out. Remove all traces of previous gypsum plaster coatings and remove all organic matter (including timber fixings) prepare all fixing points which require cutting out. Thoroughly wet or prime all areas that have high suction with SBR Bonding Additive. Apply a coat of SBR Bonding Additive or hack off to provide a mechanical key to all smooth dense surfaces. Surfaces with high levels of salt contamination may require further preparation. This may include treatment with Permagard Salt Neutraliser. Do not exceed a mixing time of more than five minutes when mixing by machine. When mixing by hand add half the contents of the bag to approximately 9.5 - 11 litres of water and mix. Then add the remainder of the bag and mix (add more water if required) to obtain the correct consistency. Renovating Plaster will be easier to use if it is allowed to stand for a few minutes before it is applied to the wall. Renovating Plaster should be applied in one coat between 10 - 15mm thick. Additional coats can be applied if a greater thickness is required. Between coats and before the application of a finishing coat, the surface should be combed or lightly scratched to provide a mechanical key. The backing coat should be allowed to set and dry for a minimum of 24 hours, preferably longer, particularly under adverse curing conditions. Thistle board, multi finishes or limelite finishing are all suitable finishes and these should be applied at 2-3mm thickness. A high quality wood float can be used when the scratch coat is to be left as the finish. Note: Final decoration should not take place for at least 12 months following DPC treatment. Read our guide to re-rendering after a DPC. Man-made fibres incorporated to control shrinkage & improve flexural strength.